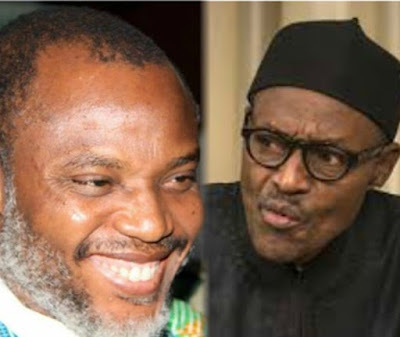 Nnamdi Kanu, leader of the Indigenous People of Biafra (IPOB), has said it is President Muhammadu Buhari and Lawal Daura, director-general of the Department of State Services (DSS), that should be detained for disobeying court orders. While speaking with The Sun, he told those calling for his arrest to demand that the president should be detained. “President Muhammadu Buhari was the one who broke the laws, he disobeyed the direct court order to release me unconditionally, not once, but twice,” he said. “Honourable Shuaibu of Wuse magistrate court granted me bail, Buhari did not release me. Hon Justice Ademola granted me unconditional bail, Buhari and his cousin, Lawal Daura refused to honour that court order. “They are the ones who should be detained for flagrant disobedience to court orders. I want the northern Arewa irredentists to call for the arrest of Buhari and Daura for flouting court order after court order, asking for my release.